As Game Of Thrones fans continue to survey the ash-covered wreckage left by Drogon in “Spoils Of War,” the director of the episode wants to assure them all that one ginger-haired troubadour was spared that fiery fate. Mashable spoke to Matt Shakman—who, despite being a first time Thrones director delivered a doozy of an entry—and the regular It’s Always Sunny helmer denied that the Lannister soldier played by Ed Sheeran was caught in the battle with Daenerys, her dragon, and the Dothraki. We’ll consider taking this into account for our next deadpool. Shakman says he didn’t meet Sheeran on set, which Mashable takes to mean that his character wasn’t a part of those final scenes. When asked about the group of Lannister men Arya met and drank with, including a singing Sheeran, Shakman flat out says “I don’t think literally those soldiers were there.” So it sounds like Sheeran’s group might have still been wandering in the forest or whatever when their fellow soldiers were laid to waste by dragonfire. 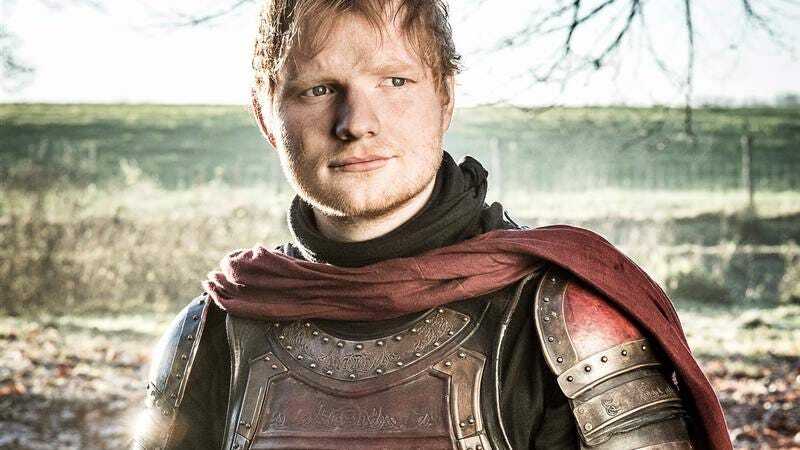 It also looks like Sheeran was right to be confident in his ability to survive a Game Of Thrones cameo.